To help you decide on the best bongs and coolest glass water pipes of 2018 we decided profile a few of the top glass companies out there. 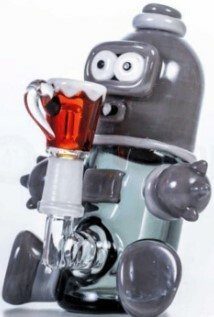 While the below list is not exhaustive it does represent some of best bong brands and small glass artists currently creating these products. Within the category of glass pipes, there are two distinct groups—heady glass and scientific glass. Scientific glass tend to be clean and minimal without much color (they are typically clear glass). Heady glass is exact opposite, focusing as much on art as functionality. Out of all the scientific glass manufacturers out there, Grav Labs is probably the biggest and most well known. 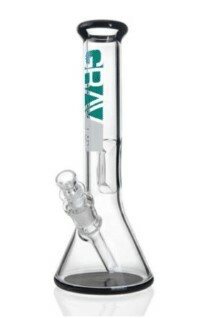 At nearly every online headshop, you can find Grav Labs scientific bongs for a reasonable price. This is a solid company, with some stellar, clean glass that holds up overtime, despite heavy use. Like Grav Labs, HiSi Glass focuses primarily on crafting scientific glass pieces with clean lines and maximized functionality. Based out of Northern California, this glass manufacturer produces high quality glass a high price point. These pieces might not be as affordable as Grav Labs, but they are more than worth it, offering an investment that will last a long time. Each HiSi bong is carefully constructed in order to provide the best hit with as little drag as possible. According to HiSi, their specifically designed percolators maximize cooling and moisture conditioning to provide an excellent smoking experience every time. 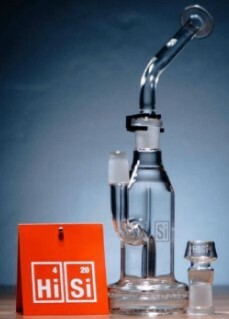 Bringing up the back of the pack with scientific glass bongs is Zob Glass. With price tags closer to those of Grav Labs, this Southern California based company offers scientific glass with a little bit of flair. Their bongs combine ingenious percolation systems and sturdy glass structures to create working pipes that enhance the smoking experience. Just as scientific glass is all about functionality, heady glass is all about aesthetics. 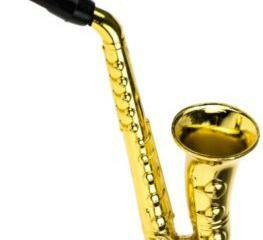 Heady bongs resemble art more than a smoking utensil. These art pieces still pack a punch though, a point proven by Grog Glass. 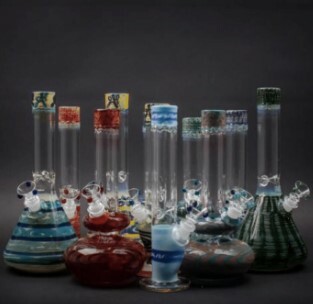 Based out of Oregon, this glass manufacturer pushes out ornate bongs that are not only aesthetically pleasing, they hit like freight trains. They might not sport the complex percolation of scientific pieces, but who needs that when you are smoking out of a bong seemingly pulled right out of a Georgia O’Keeffe painting. Empire Glassworks is another one of the premier heady glass manufacturers out there. Based out of California, Empire Glassworks makes a wide variety of glass pieces, from pop culture references to abstract creations that seem to come right out of a Salvador Dali painting. 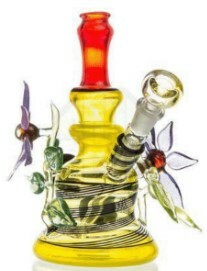 Not only does Empire Glassworks provide unique bongs that you can’t find anywhere else, the attached price tag isn’t going to burn a hole in your pocket. They are perfect for the legal cannabis smoker that wants to collect some strange, heady glass without spending an absurd amount of money. Along the same lines as Empire Glassworks, HVY Glass provides legal cannabis smokers a cheap outlet for heady glass. This Oregon based company manufactures affordable bongs and other glass pipes that are both visually appealing and functional. There is a sort of simple beauty in the bongs that HVY Glass makes. They bring out the best of both worlds with colorful and unique patterns and accents while keeping the piece itself sturdy and practical. Practical is not the name of the game for every glass manufacturer out there, though. Mothership Glass is one particular glass company that throws practicality out the window. From glass bowls and nails to elaborate, ornate bongs, this company is intent on adding a little luxury to legal cannabis. Mothership Glass was founded in Washington State with the goal to provide legal cannabis users with elite scientific glass bongs. This company works alongside popular glass artists to create pieces that go for ridiculous amounts of money. One of the bongs that Mothership Glass created in collaboration with Junichi Kojima even sold for more than $100,000. Don’t worry; they also produce more affordable bongs that still sport that iconic Mothership Glass artistic style. Glass bongs, bubblers, and hand pipes are now widely available, with both online and brick-and-mortar headshops growing at an unprecedented rate. If you are buying glass online, make sure you are buying from a trusted online smoke shop. Things to look for include great customer service, free shipping, human beings who will answer your questions and a well-designed, along with a return policy that covers breakage. The post The 7 Best Bongs Of 2018 appeared first on I Love Growing Marijuana.